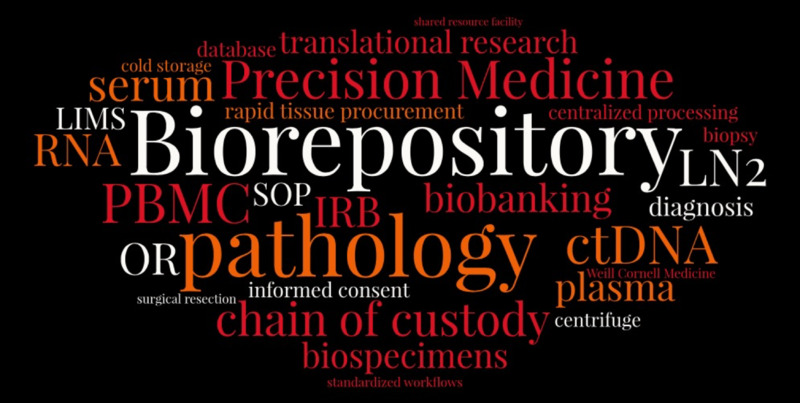 The Institutional Biorepository Core (IBC) was launched in 2017 to provide Weill Cornell Medicine (WCM) investigators with a mechanism to attain high-quality human biospecimens for their research needs. The overarching goal of the core is to facilitate basic, translational, and clinical research. Biorepository staff provides rapid solid tissue collection from the operating rooms and clinical procedure suites at WCM/NYP main campus or nearby clinics. The core has a designated Pathologists’ Assistant for expedited tissue triage, distribution and/or processing. Biofluids are processed for a wide variety of derivatives through the biorepository’s fractionation and isolation services. DNA and RNA isolation, purification and quantification from both solid tissue and biofluids. The Biorepository offers fail-safe redundancy, temperature-monitored and regulatory compliant sample storage services for the following environments: controlled RT, 4°C, -20°C, -80°C, and LN2 (vapor and liquid). Please inquire for more information about customizable solid tissue and biofluid services and the fees associated with them.